As some of you know, I got a new dryer recently. This particular unit seems to be imbued with some humidity-sensing technology since its dial no longer has just a dumb timer, but different settings based on, well, how much you serve Mother Gaia, apparently. Now, I’m no expert on nuance, so in my black-and-white world, dry is an absolute value. 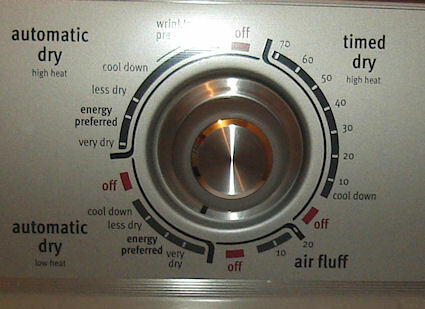 Therefore, the dial that offers me more dry or less dry is probably offering me either dry or damp. Sandwiched between the two poles on the spectrum, the dial offers me the energy preferred option. Energy preferred? Why not come right out and say it: This is what Mother Gaia wants me to choose. This is how damp and clingy the Earth wants me to wear my clothes. Its acolyte the dryer would like my clothing to retain moisture so that, when I walk around wearing these moisture-enriched clothes, I add evaporation to the water cycle and make the plants grow pretty flowers and vegetables I should not despoil for decoration or consumption purposes. I mean, come on, why not just have a separate section of the dial for drying your hemp clothes while you’re at it? Sadly, there are people who wash their clothes with Green cleaning products and then use the less-dry option on the dryer because that’s what they must do to avert global cataclysm. The people who want to avert a global cataclysm but don’t want to deal with the bother of line-drying their clothes, I mean. And they’re walking around in moist, dirty clothes, hoping to be blessed by Mother Gaia with actual dandelions sprouting in their knit sweaters and with lots of helpful bacteria breeding upon their unmentionables. Meanwhile, I’m always selecting More Dry because of my raging hydrophobia.